As soon as the weather gets nice, we all want to head to the beach, a trip that usually involves lugging loads of kit with you to stake out a plot for the day; think windbreaks, refreshments, towels and blankets plus suncream, buckets and spades. 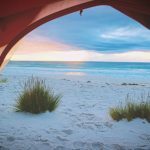 If you happen to be camping near the coast (or even if you aren’t) there is a lot of camping gear than can come in handy for a beach trip. Foot pumps and battery operated pumps are great for inflating dinghies and rubber rings so you can enjoy the fun of the open sea, and they can also be used to blow up an airbed, which would be ideal on a sandy beach. 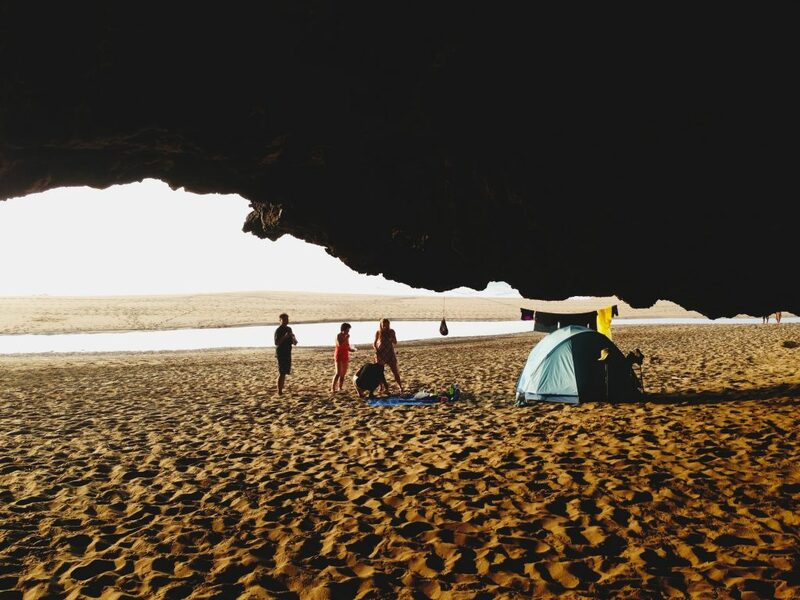 A pop up tent can come in handy providing shade and somewhere to change after a swim, and is much lighter than traditional windbreaks, just remember the tent poles to peg it down, as the beach can get quite breezy! This might mean taking all your camping stuff with you if you’re camping in the same tent, but you could always take a second cheap tent for shelter. There are even pop up beach shelters available that also come in handy in a camping or garden party situation. 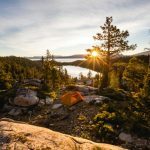 A sleeping bag can double up as a beach blanket, meaning you don’t have to take extra kit for a camping and beach holiday, and when unzipped and laid out flat provides a much larger area than a blanket or beach towels. When it gets cold towards the end of the day it also provides more warmth than beach towels, and packs down to a small size for easy transportation. A sleeping bag or camping mat will also make a pebble beach more comfortable to sit on, although anyone who has lived near a pebbly beach will no doubt have their own methods of getting comfy on stones; Brightonians are notorious for their insistence that Brighton’s pebble beach is the best, and most comfortable in the world as long as you know how to find a good spot. If you are spending a day at the coast on a camping holiday why not take your gas stove and cooking utensils with you for a beach breakfast? There’s nothing quite like the smell of sizzling sausages combined with a lovely sea view first thing in the morning, although pick your location carefully as the early morning dog walkers may have trouble controlling their dogs when faced with the temptation of your fry up! Having your cooking equipment with you also means that if you want to go fishing or rock pooling for some tasty treats you can whip up a tasty seaside supper there and then. You might even be able to find a coastal foraging course to attend that will help you find some nice, and free, accompaniments to your catch, thereby helping to keep the costs if your trip down as it means one less meal out to pay for. Camping and hiking rucksacks are great for taking all your kit for a day at the beach; the large volume of space inside the main compartments is ideal for food, clothes and sun cream, and your cooking equipment can be strapped to the exterior along with a sleeping bag or camping mats. A good rucksack will be much more comfortable to carry than several bags, especially if you have to park a distance away from the beach. Next time you go to the seaside, look at your camping equipment before you start packing and see what you can use to make your trip easier and more enjoyable.